Mr. Lawrence H. Woodward left Spartanburg,South Carolina arriving in New York in 1920. He and his family set up roots in the Bedford Stuyvesant area of Brooklyn and in 1923 opened up a funeral home bearing his name on Fulton Street. Mr.Woodward stayed in that building until 1947. His business growing rapidly made him venture out and purchase buildings on Schenectady Avenue. He made two of the ground floors his new location for business. Here at 18 Schenectady Avenue, Mr. Woodward became a familiar face throughout his community often being seen at church and civic functions. In 1960, the Woodward family welcomed newly licensed director Mr. Melvin D. Thompson. Sadly in June 1961 Mr.Woodward passed. Mr Thompson, like his friend and mentor, worked long and hard hours within the community at large. He was able to purchase the funeral home in 1968. As Urban Renewal came into the area, Mr Thompson and many others sat on boards and attended hundreds of meetings fighting for new homes,schools,stores and parks so this community would continue to thrive..With the building of a new Boy and Girl's High School in the making, Mr.Thompson would have to move to a new location. With the help of baseball legend Jackie Robinson and his construction company, Mr.Thompson chose to build just up the street. The new location at One Troy Ave was the first African American structure built and designed from the ground up to be just what it is.....a funeral home. Out of love and respect Mr.Thompson kept the name Lawrence H. Woodward and dedicated it in September 1975 to those in repose and for the comfort of their loved ones. 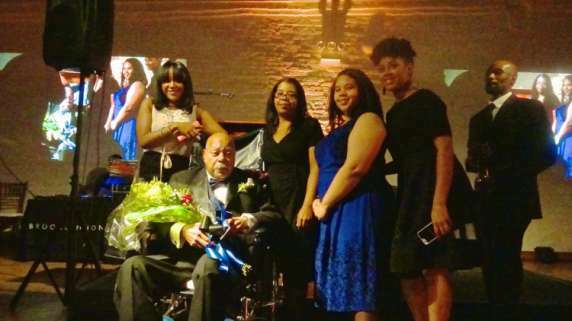 Mr. Melvin Thompson with his grand daughters at the YMCA Brooklyn Honors Award Ceremony where Mr. Thompson was the Lifetime Achievement Awarde.